HP's acquisition of Palm may finally be bearing fruit, as an ongoing media event today has revealed a significant reboot of the company's webOS-based mobile strategy headlined by the TouchPad, a new tablet device similar in many respects to Apple's iPad. Running on a dual-core Snapdragon processor at 1.2 GHz, the TouchPad offers 16 or 32 GB of storage, Wi-Fi connectivity, and support for gyroscope, accelerometer, and compass functions. The TouchPad offers essentially the same 9.7-inch 1024 x 768 display used in the current iPad, as well as a 1.3-megapixel front-facing camera and stereo speakers. HP's TouchStone wireless charging solution has also been augmented to support the new devices, not only offering charging capabilities but also supporting wireless sharing of data between devices. Multitasking is also a key feature of the webOS experience, with applications showing as "cards" that can be easily flicked out of the way to switch to a different application. 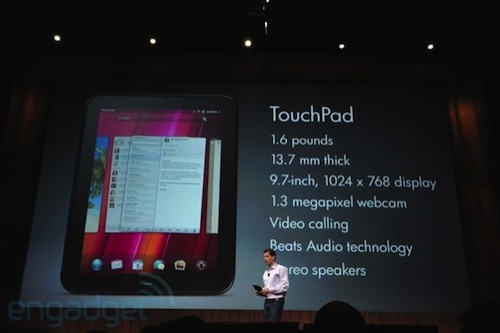 Wi-Fi models of the TouchPad will launch this summer, with 3G and 4G models to follow. There is no word yet on pricing. The company also announced a pair of new webOS smartphones: the Veer, which offers a credit-card sized form factor with a slide-out keyboard, and the Pre 3, the next-generation version of Palm's debut webOS device offering a 1.4 GHz Snapdragon processor. HP concluded its presentation by noting that the new wave of devices is just the beginning for webOS, which will be coming to other connected devices such as printers and even PCs in the future. The company will announce more details on that effort later this year. I haven't used webos and have no plans to. Anything said after this sentence can basically be disregarded. (And you kind of shot yourself in the foot by making it your first) You can't make informed commentation without being informed.